Eco Island, a new innovative and exciting community interest company has launched on the Isle of Wight. At the heart of the Eco Island initiative is to create a sustainable living hub to benefit island residents and visitors. Eco Island has developed an innovative and money saving idea of the Greenback card which entitles holders to discounts on a range of good and services. In fact, it’s estimated that a typical Isle of Wight family with an average weekly spend can save up to £400 per year in discounts. It’s great to see initiatives like this as it shows that going green is about saving money. The Greenback card is supported by companies who have a record of sustainability, and others who are looking to become more eco themselves. Those people who sign up to the Greenback card will get discounts on travel, attractions, food and drink, lifestyle, business, retail and utilities. To benefit for discounts from the Eco Island Greenback card you do not have to be an Isle of Wight resident. With just one visit to the Isle of Wight you could save enough money to recoup the initial costs. The money that Eco Island receive from the Greenback card goes back into building a sustainable community and a more eco-friendly environment. These initiatives will benefit both residents and visitors to the island. It’s a no brainer, Green Abode strongly recommends that you sign up for a Greenback card if you are a resident or visitor to the Isle of Wight. Eco Island aims to make the island energy self-sufficient from the UK mainland by 2020. It’s ambition, however, is national as it starts the journey to becoming the first sustainable energy region in Britain. The Isle of Wight is the ideal place for green energy due to it’s natural habitat. Other options being investigated are solar thermal, geothermal, biomass and CHP units, air and ground source heat pumps and a waste to energy plant. Creating green energy, however, is of no use unless there is investment in energy efficiency. 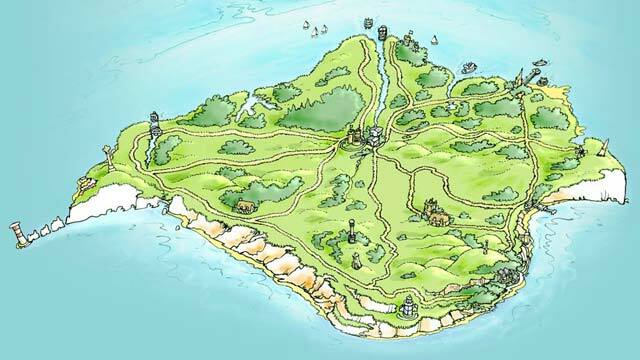 Eco Island’s most ambitious idea is to create a central hub on the Isle of Wight to help residents mange their energy resources more efficiently. The idea of the hub is to utilise natural resources, and manage the renewable energy that’s being produced. By installing smart meters in homes, these would notify householders of the best times to use appliances. For example, if there was a surplus of renewable energy, it would be a good time to use resource heavy home appliances such as dishwashers or tumble dryers. Eco Island’s ambition is wider than just being self-sufficient with energy, it’s about being more independent and less reliant on the UK mainland. This supports the growing movement towards more localised living. Living local benefits communities, is often more beneficial economically and improves the environment. “Our Eco Island Community has the opportunity to demonstrate good sustainability practice to the rest of the world. As pioneers we hope to be a beacon of hope to other communities trying to live in more harmony with nature.” said David Green. Green Abode caught up with David Green the Founder and CEO of the Eco Island Partnership, and he oozed enthusiasm and creative thinking. We wish the team all the best for Eco Island and look forward to catching up in the future.